Hampton & Richmond Borough this week re-signed striker Joel Ledgister from Chelmsford City, and his arrival could be the final piece in manager Mark Harper’s promotion jigsaw. Ledgister had a brilliant spell with The Beavers last season, on loan from Sutton United, scoring four times in eight appearances and generally being a huge threat to opposition defences. However, his loan was cut short by his parent club just before Christmas as they needed cover upfront. He then proceeded to score twice against Borough in a league match in January! Six weeks later, Ledgister rejoined Harper’s team, this time on a permanent deal for a four figure fee. He scored his first goal of his second spell against Hendon FC in the Middlesex Senior Cup, but then suffered an horrendous injury in the same game, fracturing his kneecap. That put an end to his season, and without him the team were unsuccessful in their fight against relegation. Last summer he decided to leave The Beveree, joining up with Chelmsford City, and in the process remaining in the Conference South. However, he scored just one goal in nine appearances during his brief stay at Melbourne Stadium, leading to his return to Borough. Harper has stated that he beat off competition from other Isthmian Premier clubs, and even some from the Conference South for Joel’s signature. 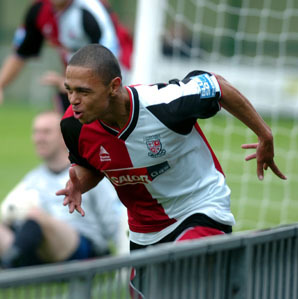 Joel Ledgister celebrating after scoring for Woking. Hopefully Hampton fans will see plenty of goals from him this season. Personally, I am delighted to see him back at the club. If it weren’t for his injury I, and other Beavers’ supporters, firmly believe the club would have survived relegation last season. Yes, he left the club after they had supported him during his injury, but he obviously left on good terms, otherwise chairman Steve McPherson wouldn’t have entertained re-signing him. Also, maybe the fact that the club supported him during that time had a huge influence on him coming back. And why shouldn’t he leave to try and play at the highest level available to him? I’m just excited to see the guy back in the red Hampton shirt and hitting the back of the net, or helping others do so, on a regular basis. While the team do play some lovely attacking football, there are times when things need to be a little more direct. One such occasion was the FA Cup tie recently at Waltham Forest. On a god awful pitch, the team struggled to string passes together, regularly resorting to lumping the ball forward. Unfortunately, as good as he has been this season, Charlie Moone is not going to win many headers against any centre half. This is where Ledgister can be vital. He is a big, strong striker who will win his fair share of aerial duels, and Moone is quick enough and clever enough to latch onto any second ball. Similarly, Ledgister will add some good height at set pieces, at both ends of the pitch. He is a great addition to the squad, and if he can stay fit all season, and we can keep hold of him for the entire campaign, he could just be that final piece of the puzzle, the difference between which division the Beavers are in for 2013-14. Posted on October 5, 2012, in UTL Archive and tagged Charlie Moone, Hampton & Richmond Borough, Isthmian League, Isthmian Premier, Joel Ledgister, Ryman League. Bookmark the permalink. Leave a comment.